NBC network and its Today show have come under fire for their decision to air an interview with Kris Jenner about her breast implants instead of this morning’s moment of silence at 8:46 a.m. held in memory of the victims of 9/11. While ABC’s Good Morning America and CBS This Morning carried the minutes silence from the World Trade Center and the Pentagon, viewers of NBC across the country had to rely upon their local affiliate to interrupt Today to witness the poignant ceremonies. While WNBC in New York City took the decision to air the commemorative events from Ground Zero and the nation’s capital, the rest of the country took to Twitter to vent their disappointment that the network had chosen to be the only national news program not to broadcast the minutes silence. 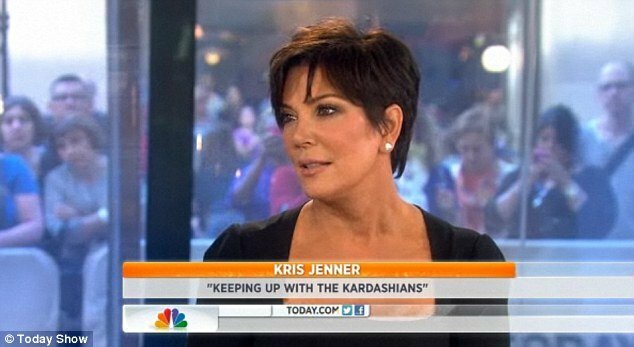 Instead of watching the events from Washington D.C. where President Barack Obama was in attendance and New York where families of the victims and representatives of the NYPD, FDNY and Port Authority Police gathered, the majority of NBC viewers were treated to Kris Jenner discussing her latest breast operation. “Shame on them: NBC skips 9/11 moment of silence for Kardashian interview,” wrote B.Loco on Twitter , expressing her outrage. Following the moment of silence other networks quickly jumped back into their routine as CBS went to a commercial break and ABC began an interview with Richard Gere. Speaking with Today‘s Savannah Guthrie on Tuesday, Kris Jenner, the star of Keeping up with the Kardashians discussed September 9th’s penultimate episode that showcased her plans to get her 23-year-old breast implants replaced. “I thought it was such a great idea to film that,” Kris Jenner told Savannah Guthrie Tuesday morning. And as Kris Jenner, 56, discussed her first breast operation since 1989 all the cable channels and CBS and ABC were broadcasting the moment silence and viewers took to Twitter to express their disgust. Some called the network’s decision a “major fail” and a “new all time low”, while another Twitter user simply said “Shame on them” for their broadcast choice. Megan Kopf, a spokesperson with the Today show, defended the network’s coverage of the 9/11 anniversary ceremony. “The Today show dedicated a considerable amount of time to September 11th coverage this morning throughout the entire show,” said Megan Kopf to POLITICO. This tops off a summer to forget for NBC, during which the network has taken criticism for their delayed airing of Olympic events such as Usain Bolt’s victory in the 100 metres sprint and asked why it did not show more of the London Paralympic Games. During the five minute interview about her cosmetic surgery aired at 8:45 a.m., Kris Jenner said that all women should be aware of the shelf life of the breast implants. “You know, take them out and change them after 10 years,” she urged all woman with implants. “That was a big message and important for me to sort of put out there in a comical way. “You know, I made fun of myself. Because at my age, you’re over 50 – like, when do you stop? Discussing her daughter Kim Kardashian’s relationship with Hip Hop star Kanye West, Kris Jenner said that she couldn’t be happier for her daughter. “He’s a great guy, I mean he is really a great guy and I think they are well suited for each other and I think they are really really happy and anybody who has kids knows that when your kids are happy, you are happy,” she said. While Kris Jenner and her family prepare for the seventh season finale of their wildly successful reality television show, the self proclaimed “momager” has said that she is looking forward to the resolution of her daughter Khloe Kardashian’s attempts to become pregnant and start a family. “She is doing good, she is really positive,” said Kris Jenner. “Somethings I watch back and I think wow, that’s kinda crazy or hard to watch.